Apparently, Sony announced a new version of the commercially-struggling Playstation 3 console a few weeks ago. 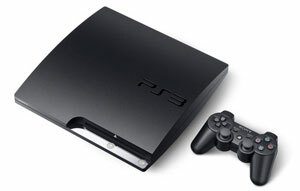 The new version is known as the PS3 Slim and will boast almost all of the same features as the original PS3. The new PS3 Slim will apparently be available on Tuesday, Sept. 1. At this time, only one version, a 120 gig model, of the PS3 Slim is being released. The new model will be priced at $299, nearly $200 less expensive than the cheapest version of the original PS3. Yahoo! Plugged In gaming news reports that the new version of the console will consume 34% less electricity, be almost 4 pounds lighter than the original and is only about two-thirds the size of the original. So, what’s the one apparent drawback of purchasing the PS3 Slim instead of buying the old mammoth version? The PS3 Slim will not include backwards-compatibility; meaning that you will not be able to play your Playstation 2 games on the new PS3 Slim. Will this make a major difference to consumers? Only time will tell. Microsoft caught a lot of flak when the Xbox 360 console was released with extremely limited backwards-compatibility.